The students named on the posters are affiliated with the Muslim Students Association (MSA), Students for Justice in Palestine (SJP), Jewish Voice for Peace (JVP), and U of C Divest. The David Horowitz Freedom Center placed similar posters on campus in October of 2016 and May of this year, after College Council (CC) approved a resolution calling for the University to divest from companies connected to the Israeli occupation in May 2016. Another poster depicted Rasmea Odeh, a community activist convicted in 1970 of bombing an Israeli supermarket who later came to the U.S. The posters are part of a campaign by the David Horowitz Freedom Center, a conservative organization that oversees campaigns criticizing leftism and opposition to the state of Israel, particularly on the issue of the Israeli occupation of the West Bank. 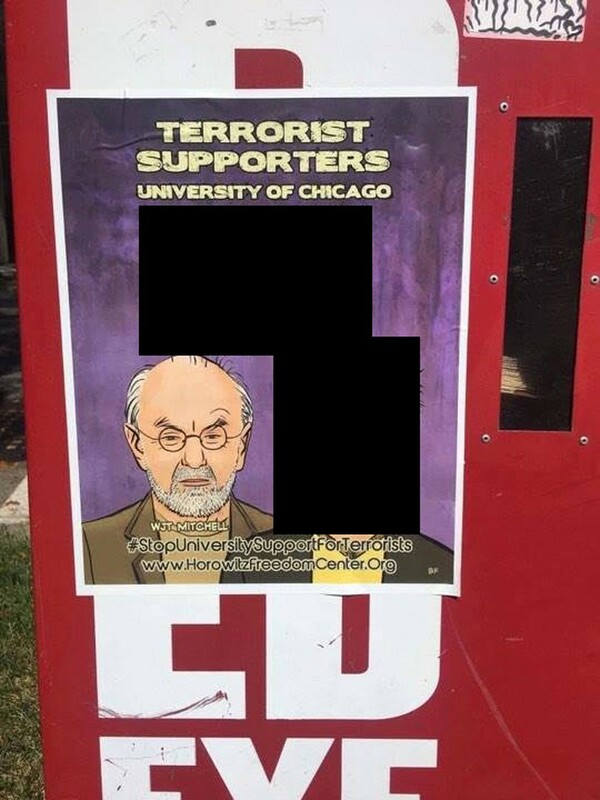 The poster campaign coincides with an announcement by the Center that it has named UChicago and DePaul University to its list of the “Top Ten Worst Schools that Support Terrorists.” UChicago’s inclusion is credited to the presence of an active chapter of SJP and the divestment campaign. On Wednesday, Dean of Students Michele Rasmussen sent an e-mail to the University community condemning the posters and vowing to remove any further related postings. Rasmussen, along with Provost Daniel Diermeier, sent a similar e-mail to the University after the postings last May. Like May’s posters, the most recent posters include names that can all be found on Canary Mission, a website that posts information about individuals connected to the Boycott, Divestment, and Sanctions (BDS) movement across the US. The individual also said that those targeted by the posters have asked the University several times to pursue a lawsuit, among its other actions, though no lawsuit has been filed. According to internal University documents obtained by The Maroon in July, the University considered legal action against and public condemnation of the Center after the postings in May. Individuals mentioned on Canary Mission who were contacted by The Maroon during the summer did not indicate that they had heard about any further action by the University. The documents included an annotation mentioning that the Center had threatened legal action against UCLA after its vice chancellor for equity, diversity, and inclusion, Jerry Kang, publicly condemned the organization for a similar set of postings on UCLA’s campus. Professor W. J. T. Mitchell, who is depicted in one of the posters, responded to questions over e-mail. A copy-edited version of his response is included below. Mitchell also asked that the The Maroon publish a partially redacted image of the poster. Do you have any idea why you were mentioned on the poster? I assume that I was mentioned because I have published extensively on the question of Israel/Palestine. I have also spoken at universities and art institutions in Israel and the West Bank, including Hebrew University, Bar-Ilan University, the Tel Aviv Museum of Art, Birzeit University, and the International Academy of Art Palestine. My position on the question of Israel/Palestine is well known. I support BDS, a peaceful, non-violent movement to Boycott, Divest, and Sanction Israel for its illegal occupation of Palestinian lands and its oppression of the Palestinian people. I also support the continued existence of the state of Israel as a flourishing democracy living in peace with its neighbors. I emphatically reject any charge of anti-Semitism. I have many friends on both sides of the Green Line, and support the work of both Jewish Voice for Peace and Students for Justice in Palestine. How and when did you find out that you were mentioned? A colleague sent me a photo of the poster. Have you been targeted by the Horowitz Center or other organizations over related issues in the past, and if so, how? Have you been in contact with the Horowitz Center, over this or past issues? Are you planning any response to the posters, including legal action or a request to the University for action? I am considering legal action, and I intend to fight back against these ridiculous attacks with all the resources at my disposal. I have requested that the University make a public statement condemning the Horowitz Center by name, and calling it our for what it is: a hate group dedicated to the suppression of free speech and association. These attacks are not merely against me and students and colleagues: they also name the University of Chicago as a supporter of terrorism. This sort of slander should not go unchallenged, and I have urged the provost and president to make an emphatic response. So far they have only issued vague declarations about unnamed “organizations” and unauthorized posters. I have urged them to go further, and to issue a public denunciation of the Horowitz Center. I have also requested that they consider legal action, and engage the services of an online “reputation protection service” that can respond to the use of social media as an instrument of slander. I have further suggested that it would show some courage for the University of Chicago to join with the other American universities attacked by the Horowitz Center in a unified statement of condemnation. What is your comment on being singled out on the poster? Actually, I am honored to be singled out. I do not feel particularly threatened by this sort of slanderous attack; that is what tenure is for. As Franklin Delano Roosevelt said of the reactionaries who tried to stop the New Deal in 1936: “I welcome their hatred.” One measure of a reputation, in my view, is what sort of enemies you make. I am happy to consider David Horowitz as an enemy, not just of me personally, but of all that is good and decent about the life of a university professor, and of the whole professional pursuit of knowledge and human values. I just have one question for him, and the artist who drew my picture. Was it your intention to make me look like Salman Rushdie? And does this mean that you are issuing a fatwa against me? I am attaching a link to a redacted version of the poster, with the names of the students blanked out. I would be happy to have you reproduce this in The Maroon.